This is the true story of Julia Hill (aka Julia Butterfly Hill), the daughter of a poor Arkansas evangelist, who journeyed to Northern California and, at 21, found her spiritual calling by tree-sitting for two years atop, Luna, a thousand-year-old redwood tree, to protest the haphazard razing of American forests by money-minded logging companies. 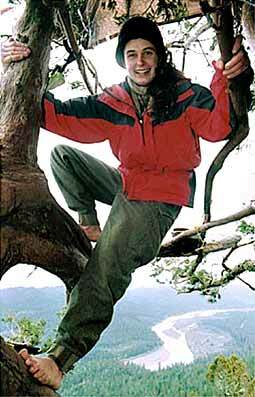 As she sat up there, Hill became the focus of media in search of a hot story, the reluctant friend of celebs like Woody Harrelson, who spent a grumpy night sleeping in that tree, and the antagonist of both right-leaning hardhats and crunchy types on the environmental left, who objected to Hill's individualist protesting. A very complicated tale, but told in a generally perfunctory way by documentarian Doug Wolens, who resorts to the usual talking heads interviews with those on both sides of the issue and, conversing with Hill up there in Luna, his unchallenging questions encourage Hill's expected flow of rhetoric. There was a so much deeper documentary to have been made, with metaphysical implications: there's something slightly Christ-like about Hill's martyrdom or, more obviously, Joan of Arc-like, down to her angelic  and virginal  purity. For two austere years, Hill's sexuality became sublimated into a pantheistic ardor. She didn't need a boyfriend, she's explained, since she had that 180-foot tree.